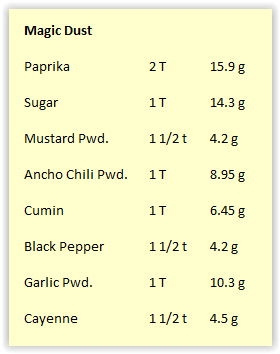 Here are two interesting barbecue rubs with decidedly different flavor profiles that are both well worth trying. I have reduced the scale of the original recipes by ¼ and have also gotten the weights. I have also removed the salt from the first recipe to make it easier to use. The Magic Dust is from Peace, Love and Barbecue by Mike Mills and Amy Mills Tunnicliffe. The second uses New Mexico hot chili pepper which is about half as hot as cayenne. The ABRFJ is from here: http://tvwbb.com/showthread.php?32640-A ... -(for-Jane) by Kevin Kruger. This scale should be enough to do a rack of ribs for test purposes.